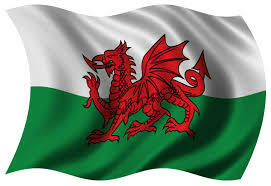 “Never before, in modern times, has so much pagan symbolism been used by the British establishment for a state occasion. The 2012 Olympic opening ceremony was a triumph of expression of British identity that for once did not ignore our cultural and spiritual pre Christian roots. 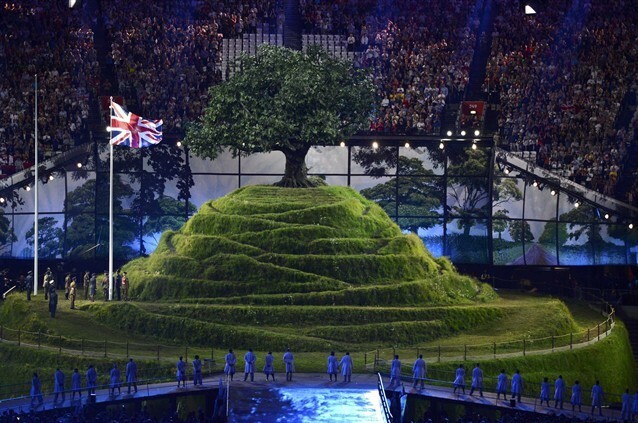 “The tor in the Olympic stadium is crowned by a mighty Oak tree, which every pagan will recognise as a potent symbol of the Druid faith, a sign of the divine sovereignty of nature, and the protective spirit which watches over us. “How symbolic that the flags of every nation, including our own, would assemble on the slopes of this sacred hill of legend, beneath the sovereign protection and oversight of our sacred tree, the life giving, oak. “The scene indicating the start of the industrial revolution demonstrates the violation of our accord with nature as the tree is plucked from the soil, to make way for William Blake’s ‘Dark Satanic Mills’. “Teams of Athletes were led into the arena behind their national flags escorted by a young man or young maiden wearing off-white robes and flowers as a reflection of the traditions of the Druids. “Jerusalem” is the unofficial national anthem of Great Britain, and for this reason only British subjects seem to understand its import. The hymn is not based upon Scripture, but on apocryphal and pseudepigraphal books not authored by witnesses to the earthly life of Jesus Christ. They are Gnostic forgeries written to mislead mankind to a false Christ. The apocryphal legend tells of Joseph of Arimethea landing at Glastonbury where he established Britain’s first monastery. According to the legend, Joseph became the country’s first evangelist and the ancestor of many British monarchs. As the legend developed over centuries, Joseph was alleged to have brought the “Holy Grail” to Britain, which gave rise to the legend of King Arthur and the Knights of the Round Table. According to the legend, King Arthur and Queen Guinevere were buried at Glastonbury Abbey, in the cemetery on the south side of the Lady Chapel between two stone pyramids. According to British tradition, Joseph of Arimethea was the uncle of Mary the mother of Jesus, and therefore belonged to the tribe of Judah. The legend also claims that Joseph was the ancestor of the mythical King Arthur. (See phony British-Israel genealogy of Jesus descendants: Messianic Bloodline & Royal Christian Dynasty of Great Britain) Even at the present time, the British monarchy claims to be of the Messianic bloodline of Judah; in actuality they are the apostate tribe of Dan. 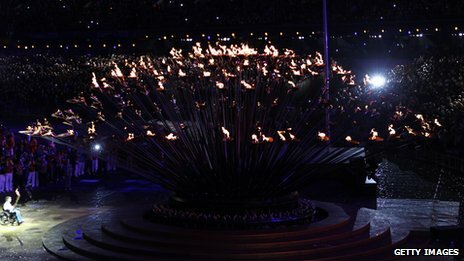 The Artistic Director for the Olympics opening ceremony was Oscar winning British producer Danny Boyle. “Danny Boyle” and “Danny Boy” were a cryptic tribute to the tribe of Dan or the Tuatha de Danaan and, a coded message that both are alive and well and in charge of the global power structure. 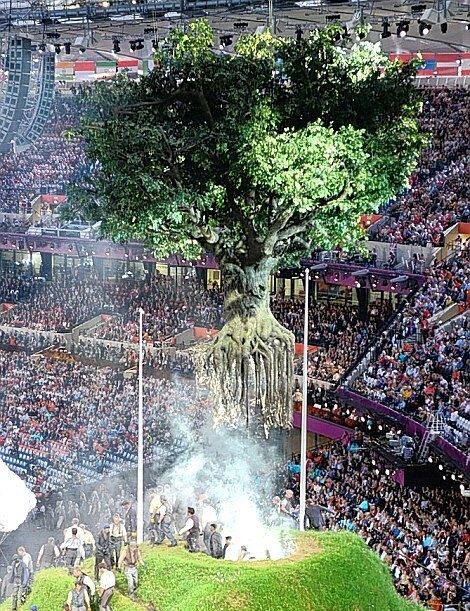 The opening ceremony incorporated many subtle allusions to the tribe of Dan. A serpentine path wended its way through Olympic stadium, ostensibly the River Thames which flows through London and Oxford, but symbolically invoking the Serpent god of the tribe of Dan. The London Philharmonic Orchestra then played Nimrod composed by Edward William Elgar. Nimrod was the son of Cush and grandson of Ham, whose other son, Canaan, was cursed as were his descendants, the Canaanites. Nimrod was the first hunter of men so it is fitting that this ‘warrior against mankind’ was honored at the international Olympics Games during the warrior festival of Lugnasadh. 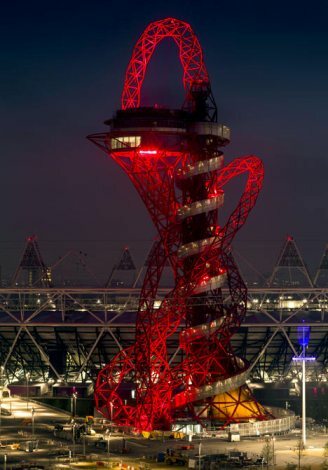 Nimrod set the stage for the London Olympics opening ceremony — a brazen display of pagan imagery which proclaimed “in the face of the LORD” the impending revival of Nimrod’s global kingdom. The centerpiece of the Olympic stage was a replica of Glastonbury Tor, a sacred Druid site in the southern town of Somerset, England, near the location where Joseph of Arimathea is alleged to have landed. The Holy Grail symbolizes bloodline of the fallen angels with whom the tribe of Dan intermingled at Mount Hermon, the sacred site in northern Israel which was believed to be the “Gates of Hell.” (Matt. 16:13,18) The descendants of these unholy unions, the Druids, continued their quest for the unholy Grail at Glastonbury Tor. Today the Druids eagerly await the return of their angelic ancestors. During the opening ceremony, a Shakespearean actor read lines from Shakespeare’s play, The Tempest, in which Caliban described Britain as a magical island. 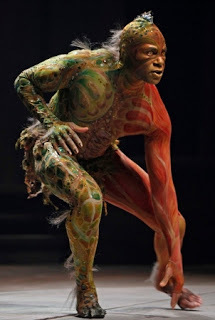 Caliban, Prospero’s slave on the island, is half-witch and half devil. Isles of Wonder provided the inspiration and theme of the opening ceremony, which was choreographed to portray the British Isles as among the islands in the ancient civilization of Atlantis. A stone situated at the source of the River Thames was shown having the inscription Isles of Wonder, which is also the name of the official soundtrack of the ceremony. “Greek tradition located the island in which Olympus was situated ‘in the far west,’ "in the ocean beyond Africa,’ ‘on the western boundary of the known world,’ ‘where the sun shone when it had ceased to shine on Greece,"
The god, Pan, rules over Pandæmonium which is located under Mount Hermon/Paneas in the territory of Dan. Queen Elizabeth and “James Bond” attended the opening ceremony, the Queen making a less than grand entrance after their alternates parachuted from the royal helicopter. Queen Elizabeth I employed John Dee as her astrologer, cryptographer and spy. “John Dee (1527-1608) was a fascinating genius, considered a magus, philosopher and alchemist who captured the attention of the royal courts and best minds throughout Europe. You were either intimidated by his ideas and reputation or you wished to be influenced by them. It has only been in the last century that we've had a more sober approach to Dee, thanks to such authors as Peter French, Francis Yates, Gerald Shuster and Richard Deacon who have rescued this ‘man of grand design’ from obscurity and have realized how significant a thinker he was. “Elizabeth was very much interested in the occult. Dee was responsible for choosing the most auspicious date for Elizabeth’s coronation which was on January 15th, 1559. The Queen was so impressed by Dee that she eventually travelled with her court to Mortlake, for the purpose of seeing his great library. “Dee has been defamed through the centuries as a necromancer, but it’s the opinion of many writers that his angelic-cabalistic-alchemical work, his Philosophers Stone, the ‘Monad Hieroglyphica’ (1564) may have been a cover for covert operations carried on in the name of her majesty. The 007 was the insignia number that Elizabeth was to use for private communiques between her Court and Dee. 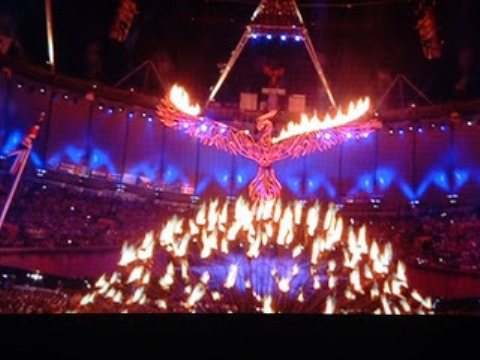 The Olympic ceremony appeared to invoke a future eruption of fallen angels from the bottomless pit at Glastonbury Tor. In Arthurian lore, the Lord of the Underworld resides in a mythical Isle of Glass, i.e. aka Glastonbury and the Isle of Avalon, where Joseph of Arimethea supposedly buried the Holy Grail. “Thus, the sleeping, half-dead gods who inhabit the subterranean tombs of Saturn, Satan, Hermes, Hercules, and even Christian Rosenkreutz (as an embodiment of Osiris, the solar god-king) could all mythically represent the same fallen kingdom, which, having lost the Grail and its mandate to rule, has occulted itself, gone underground, become invisible, or fallen asleep, until such time as the proper individual shall come along to liberate him/it. Then the sunken kingdom shall rise, the dreaming lord shall awake, the phoenix emerge from the ashes, and the proper universal balance shall be restored. In the meantime, the secret royal doctrine is kept alive by the initiates/descendants of that sleeping god (the same doctrine that is written upon the Grail in its form as the Emerald Tablet, or Gorral). The Secret Book of the Egyptian Gnostics, by renowned historian and a scholar of Egyptology and Greek papyrology, Jean Doresse, revealed that in Egyptian mythology the rising Phoenix heralded each new era of Biblical history. The plan for the new era is to resurrect the fallen angels of the pre-flood civilization and recreate the Garden of Eden. In this idyllic new age, these demon gods will present themselves as reincarnated Atlantean high priests and priestesses who will teach mankind the Hermetic sciences of sorcery, magic and divination, as they did in the halcyon pre-flood days. The signs and lying wonders following will be universally acclaimed as signs from God. For more information, see: Heeding Bible Prophecy: New Earth: Garden of Eden (Atlantis). “Part of the seasonal-themed closing ceremony, spoken by Rory Mackenzie, a representative from Help For Heroes, was in fact written by Druids from the British Druid Order (BDO). “Philip Shallcrass (aka Greywolf), Chief of the British Druid Order, says that the original ritual was written to bring people from different backgrounds and faiths together, so ‘its use in the Paralympics closing ceremony seems perfectly in keeping with this original intention.’ While the 2012 London Olympics opening ceremony featured brief hints of Britain’s pre-Christian past, it featured no explicit contribution from the vital Pagan threads that exist in the United Kingdom, a nation that has played a huge role in the revival of Pagan religions. 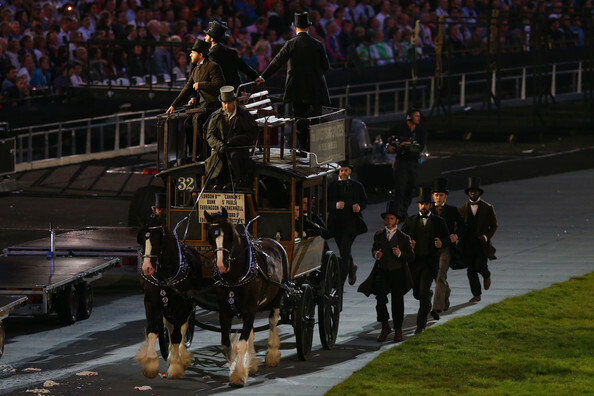 So it seems fitting that the last closing ceremony in London, for the Paralympic games, would explicitly reference modern Pagan contributions to British culture. Here’s a brief excerpt of the Druid liturgy used during the closing ceremony. 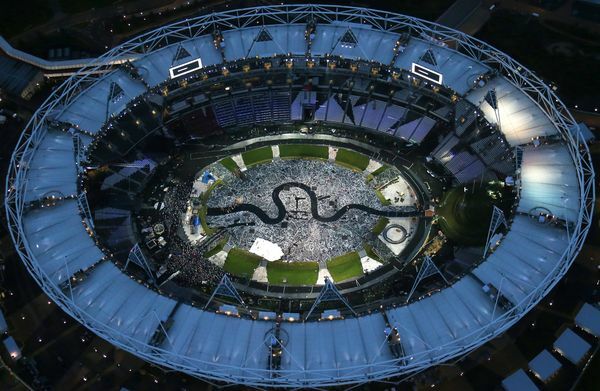 So “while the 2012 London Olympics opening ceremony featured brief hints of Britain’s pre-Christian past,” the true history of pre-Christian Britain was undergoing an image makeover by the mass media. “The United Kingdom has played a huge role in the revival of Pagan religions” largely because their propaganda mills have concealed the real character of Druidry under the respectable guise of Anglicanism and has radically changed the public perception of Druids from demonic cannibals to harmless lovers of nature. To insure the total transformation of the Druid image, Druid Studies were made compulsory in UK Schools in 2012. In Great Britain, “The Sovereign holds the title ‘Defender of the Faith and Supreme Governor of the Church of England’.” The current Sovereign, Queen Elizabeth II, was initiated as a Bard in the Druid Order when she was a Princess. Prince Charles is also a Druid and most likely other members of the Royal Family are Druids. The Queen and her offspring are descendants of the tribe of Dan, which the patriarch Jacob prophesied would be the serpent seed. Like the serpent, the Danites would conceal their presence, lie in wait, infiltrate and destroy by means of stealth. “The Druid Order traces its origins back to the Pherryllt. The Pherryllt had a Druidic Grove at Oxford and were associated with what is now known as the Celtic Church. In 1166 This Grove of Druids were persecuted by order of the Bishop of Oxford of the Roman Church. Should the membership of the Royal Family in the Druid Order be construed to mean that either Prince William or Prince Charles is the Antichrist? This widely promoted deception was shown to be the counterfeit in Part 10. 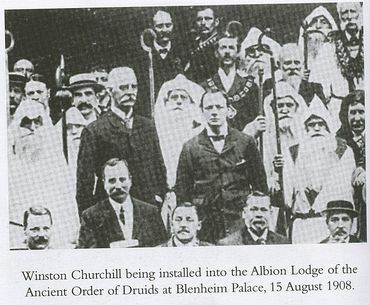 Former Prime Minister Winston Churchill, also British nobility through the Spencer line, was installed into the Albion Lodge of the Ancient Order of Druids in 1908. 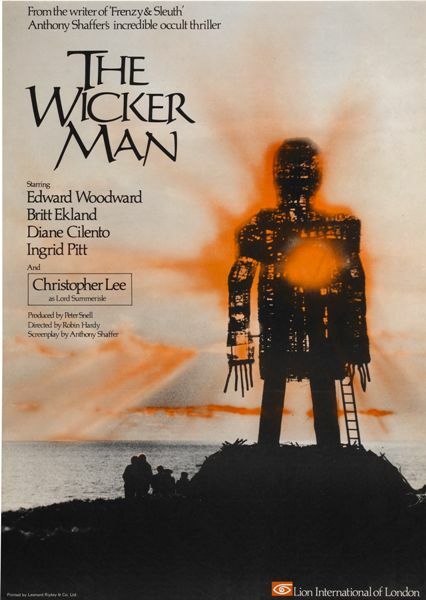 The Druids worship their false gods with human sacrifice, therefore it is not surprising to find that Sir Winston Churchill was a leader in the eugenics movement. Founded in Great Britain with branches in the United States and Germany, the Eugenics Society developed plans in the early years of the 20th century for elimination of the inferior races. Sir Winston Churchill was known among European scholars as the Godfather of the United States of Europe. He also maintained a friendship with Billy Graham, who is a 33º Mason and prominent Merovingian. Other friends of Billy Graham include J. Edwin Orr and Abraham Vereide who mentored Harald Bredesen, who mentored Pat Robertson. “Christian pilgrims still come to the town but they are outnumbered now by Pagan and New Age pilgrims and by spiritual seekers who are drawn here by the numerous legends that coalesce around key features of the town and surrounding countryside. Echoes of the Druids, Joseph of Arimathea and Jesus, King Arthur with his Queen Guinevere can all be found here. The former Archbishop of Canterbury, Rowan Williams, is a confirmed and practicing Druid. Rowan Williams performed the wedding ceremony of Prince William and Kate Middleton before he retired. 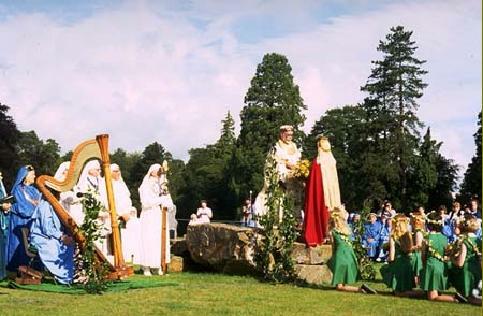 In the photo below, Archbishop Williams is seen being inducted into the Gorsedd of Bards in 1998. Four years later, in 2002, he was elected to become the Archbishop of Canterbury. 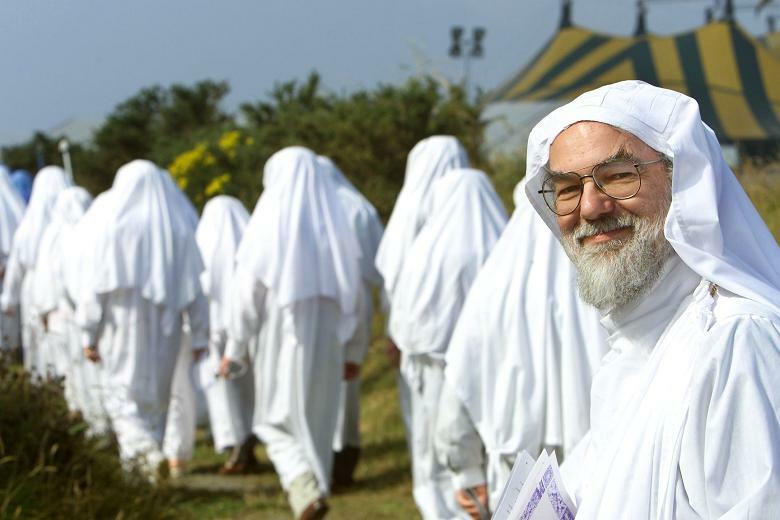 At his induction, the Archbishop of Canterbury wore the white robes of the high priesthood in the Druid Order. We deduce from the symbolism of his white robe that that Rowan Williams had already passed through the lower degrees of the Order. It is also reasonable to assume that Rowan Williams was a veteran Druid when he became the Archbishop of Canterbury and when he performed the Royal wedding. The profiles of various distinguished public figures and church leaders in Great Britain and America are evidence of the truth of Manly P. Hall’s statement, that many dignitaries of the British religious and political world are high initiates in the Ancient Order of Druids. This is not a late development, however. Druids have been posing as Christian ministers since before the Reformation. Christians may be shocked to learn that John Wycliffe, the “Morning Star of the Reformation,” was an member of the Ancient Order of Druids. The Bible Museum reveals that Wycliffe was a member of “the secret society of Culdees,” which is another name for the Druid Order. The Bible Museum does not mention that Saint Columba was an Irish monk who established numerous monasteries throughout Ireland and Scotland. The “evangelical Bible College” started by St. Columba was the Celtic monastery at Iona from which Columba disseminated the Nestorian heresy which denied the union of the two natures of God and man in the Person of Jesus Christ. The Culdees were not Christians but Druids, whose name derived from the ancient pagan land of ‘Ur of the Chaldees’ in Mesopotamia, whence Abraham went forth to the land which God had promised him. John Wycliffe and the Lollards, his revolutionary movement, were also “rooted in Druidism and branched into (infiltrated) Christianity.” The name “Lollard” was derived from the Latin lolium, which meant “a wild weed or vetch (often translated as ‘tares’) which can choke out wheat, as in the parable from Matthew 13:24-30.” Wycliffe did not translate the Bible attributed to him, but was a political agitator. For more information about John Wycliffe’s Druid affiliation and his true role in the pre-Reformation period, please read The Lollard Movement and The Wycliffe Translation. These pages contain important historical information, especially about the Avignon Papacy, that has been covered up by “those dark Satanic propaganda mills”—to borrow a phrase from Blake’s heretical poem—which mass market revisionist histories of the Church. The European Council of Princes is comprised of the Druidic hierarchy who are the Overlords of Eurasia. 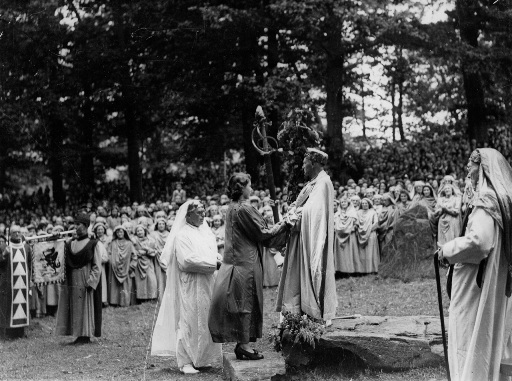 “The Ancient Order of Druids in America is descended from the Ancient Archaeological Order of Druids (AAOD) founded in 1874 by Robert Wentworth Little, an English Mason and Rosicrucian. Little is perhaps better known as the founder of the Societas Rosicruciana in Anglia (SRIA), the immediate predecessor of the Hermetic Order of the Golden Dawn. Little’s Order drew on nearly two centuries of previous Druid orders in Britain. While many of the original members of the AAOD were Masons, Masonic membership was not originally required for admission.